Kraftwerk, the German pioneers of electronic music might be averse to the idea, but it seems they are undergoing the transition from revolutionary innovators to familiar museum piece with uncharacteristic grace. Their eight London shows took place in the appropriately stark industrial space of the Tate Modern’s Turbine Hall. A rapt audience wearing 3D specs thrilled to the opening declaration of "We are the robots" on the fourth night, when Kraftwerk performed 1978 album The Man Machine in full, faithfully reproducing every note, with only Ralf Hutter’s live vocals offering any substantial variation from the vinyl original. The music sounded frightening and futuristic 35 years ago. In 2013 it seemed like quaint science-fiction, still infused with romance and imagination, but strangely timeless. 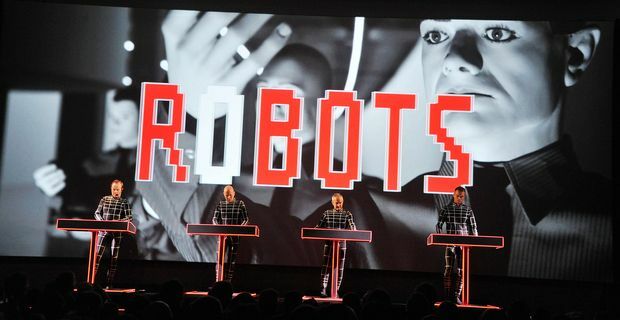 The 3D visuals provided the multi-media aspect, adding an extra element to Kraftwerk’s post-modern project of archiving their back catalogue in a series of elaborate performances in museums and galleries. They have already brought complete album run-throughs to the Museum of Modern Art in New York and to Dusseldorf as part of their retrospective Kraftwerk The Catalogue 1 2 3 4 5 6 7 8. They call it a "chronological exploration of their sonic experiments". It’s a tad more ambitious than those 70s bands playing the greatest hits to decreasing returns in provincial community centres, but the idea is essentially the same. The 66 year-old Hutter, the only remaining original member of Kraftwerk, rarely provides interviews. Speaking to the New York Times last year he insisted that Kraftwerk was still a creative operation. "Kraftwerk is a living organism," Hütter claimed, saying that performances constantly reinterpret the old music. "Music is never finished. It starts again tomorrow. The record is just a record, but for us it’s nearly boring. We are operating, we are upgrading, we are updating continuously. There’s continuous reprogramming going on, and composition and new concepts are also coming."